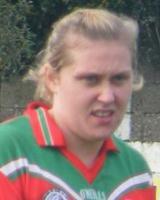 Captain Profile name: Michelle McNama Club: Drumkeerin Ladies Position: Full Back Age: 19 Occupation: Student in NUIG Ladies Gaelic Football Achievements: (club) Captain of the u12 girls winning County and Connacht finals in community games Captain of u14 ladies winning the 9 a-side final and mixed u14s 15 aside league champions Captain of the u16 ladies winning the 9 aside championship in 2010 along with Junior B champions (pps/college) Captain of Lough Allen College schools team in which we were runners up in the Connacht final (county)U14 winners of the All Ireland Division 3 Blitz in 2008 Minor runners up in Connacht B final in both 2011 and 2012 Toughest opponent: Roisin Fowley When did you start playing Ladies Gaelic: U10s High point of your career to date: Winning the Junior B final at 15 after a reply and by a point. Biggest Disappointment: Losing the schools Connacht final in 2012 Favourite Player: Female:Cora Staunton,	Male: Ger Cafferkey Most embarrassing moment on or off the football field: letting a goal through my legs in national school! Favourite Food: Chinese Nickname: Mac Favourite Ground: Tuam Stadium Favourite Ladies Gaelic Football Skill: Blocking, â€˜The Dummyâ€™ One rule you would change in our game: Sin Bin Influences on your career: Coaches, Family and team mates.